Dartford parkrun 22 fell on the Saturday in between Christmas and New Year, and while the cold North Westerly wind did its best to persuade any potential runners to stay in bed, I headed over to Central Park to meet Richey and Adam to get the course set up and ready for the 9am start! Our main worry was that a few hours of heavy rain the previous evening could have left the corner at the bottom of the trail waterlogged, so without a moment of delay, we headed over to check it out. It turned out that the corner was pretty similar to the previous week and our 'A' course was declared to be good-to-go. 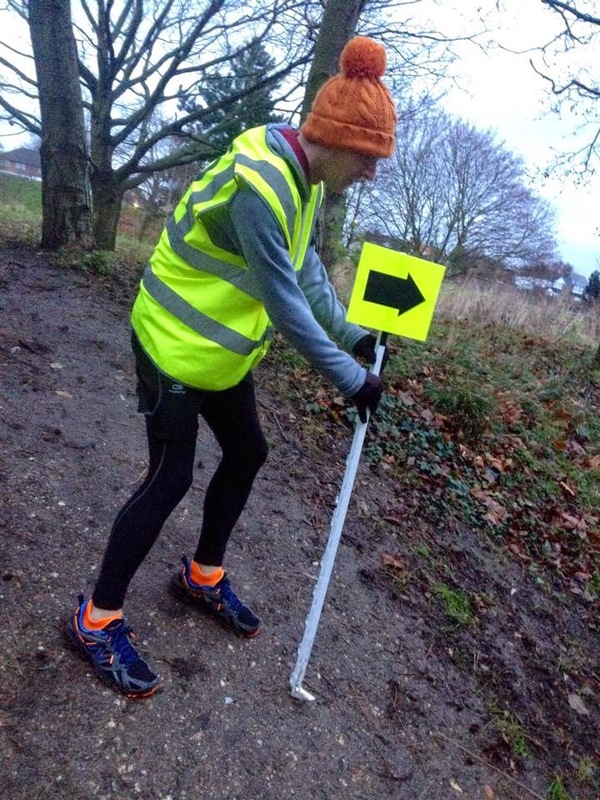 The wind had blown a few twigs and small branches down so we cleared the path of the worst offenders and continued to get the rest of the signage placed around the course. Out usual HQ was closed for the day so the runners and volunteers had to huddle, shuffle, jog or camp-out in the toilets in search of a little warmth. Adam was the run director for the day and sent the runners on their way following his pre-run briefing. I was pretty cold already and I felt a little creaky throughout the first kilometre. I found a few dog-sized obstructions on the paths every now and then during the second kilometre. The third kilometre contains Mick Jagger's leg so I always get a little cheer from my daughter as I pass her. The fourth kilometre is always the toughest, but today's north-westerly wind meant that the we had a cold, fierce headwind to contend with along the top of the football fields. Plus, before reaching the top, the trail section was at its slipperiest to date with traction being difficult even in trail shoes. Once out of the headwind, the fifth kilometre was hard, but was actually a delight to run in comparison to the fourth! Finished (results), I slipped on my volunteering jacket to get started on barcode scanning and slowly got colder and colder. My daughter helped me with a bit of scanning and once it was all done, I headed over to the gardens to retrieve some signs. Back at the storage box, myself, Adam and Richey agreed that despite the weather trying its best to keep people away, we actually had 83 runners and 12 volunteers, the event had gone really well. 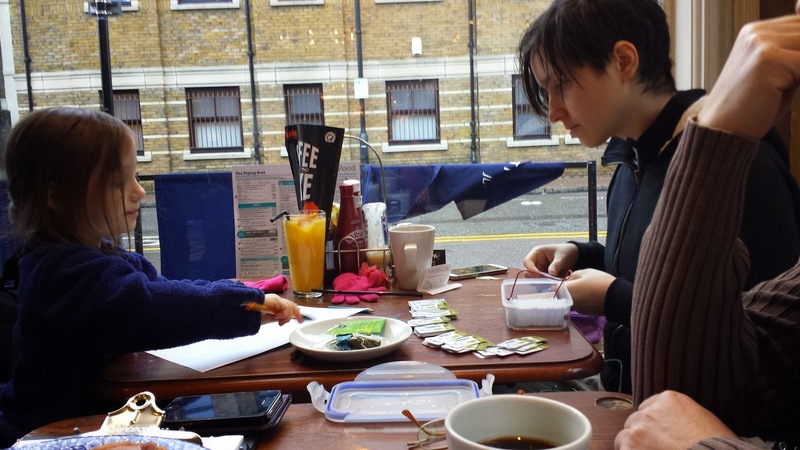 With the Dartford Harriers' clubhouse closed, we decided to head over to The Flying Boat pub with the rest of the gang to take care of the results processing and token sorting. 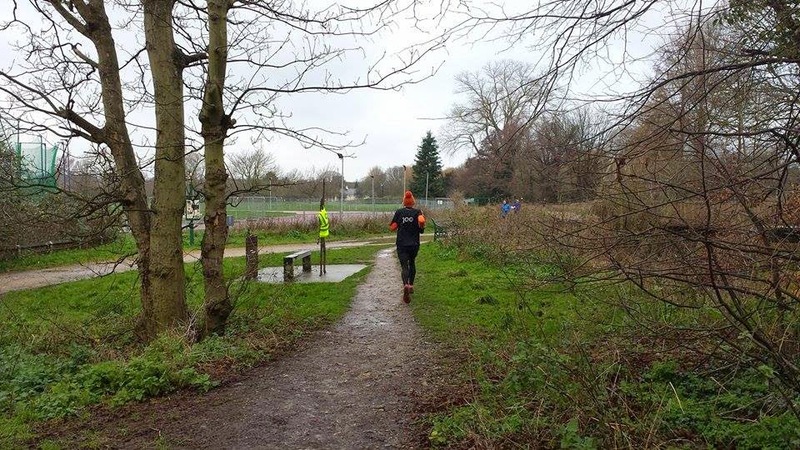 It was also a great opportunity to chat about our running plans for 2015 (a 24hr relay race for #teamslgr, perhaps) and to tuck into a nice hearty veggie breakfast.